With a stay at Puri Sayang Bungalows in Gili Trawangan, you'll be near the beach, just a 4-minute walk from Public harbour ticket office and 6 minutes by foot from Gili Trawangan Night Market. Featured amenities include luggage storage and laundry facilities. 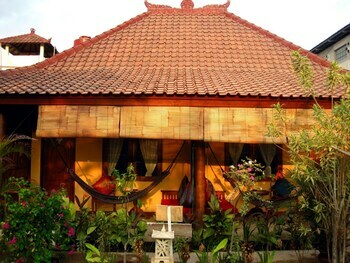 With a stay at Karana Villa Bali in Denpasar (Mahendradatta), you'll be close to Kampung Arab and Seminyak Square. With a stay at Airy Sanur Danau Tamblingan 60D Denpasar Bali in Sanur, you'll be within a 15-minute walk of Sanur Beach and Sanur Night Market. Located in Legian (Padma), RedDoorz Plus @ Padma Utara 2 is within a 15-minute walk of Kuta Beach and Legian Beach. With a stay at Hotel Surya Lama in Jakarta, you'll be within a 15-minute drive of National Monument and Jakarta Cathedral. Featured amenities include a 24-hour front desk and multilingual staff.